FRESNO, Calif. (KFSN) -- As we reported earlier this month, Avenal boxer Jose Ramírez will defend his title in the Central Valley. 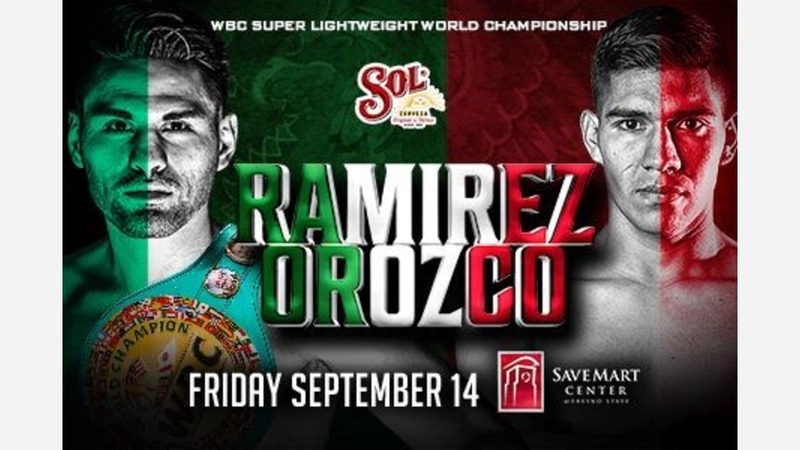 Ramírez will defend the WBC 140-Pound title against unbeaten challenger Antonio Orozco at Save Mart Center on Friday, September 14. Ramírez was originally scheduled to defend his title at the Save Mart Center on July 7 against Danny O'Connor, but the bout was canceled after O'Connor was hospitalized for severe dehydration before the weigh-in. If you purchased a ticket to the July 7 "Protecting Home" boxing event at the Save Mart Center, you will be able to exchange your ticket for a ticket of equal value for the Sept. 14th Jose Ramírez fight. The tickets can be exchanged beginning Friday July 27 through Friday, Aug, 3. If you purchased your ticket at the Save Mart Center Box Office please bring your ticket with a photo ID anytime between Friday, July 27 at 10 a.m. and Friday, Aug. 3 at 4:30 p.m. Please note the Box Office will be closed on Friday, July 27 at 1 p.m. If you purchased your ticket through Ticketmaster phone, website or mobile app, please send the name of the ticket purchaser, the billing address of the credit card user and a valid e-mail address to fightexchange@savemartcenter.com. Your new ticket will be emailed to the address provided within 72 hours. If you received a ticket to the July 7 "Protecting Home" boxing event from a sponsor or media outlet, you can bring that ticket to the box office to receive 50% off of a ticket for the Sept. 14 boxing event based on availability. Deadline to exchange tickets is Friday, Aug. 3 at 4:30 p.m.
Tickets cannot be exchanged past the deadline listed above. After Aug. 3, you can bring your ticket to the box office and receive $10 off any price level based on availability. Tickets in floor sections 4,5,8 and the interior ring are not available for exchange and you would contact the provider of that ticket for info as they were not public.